Front from left, Wallace Booth, Gavin Dear and Callum Macaulay were joined at their reunion by, back row, Ian Rae, George Crawford (the non-playing captain in 2008) and Spencer Henderson. I t may only have been small and informal but it was definitely merited. I am referring to a get-together by three people in particular, but also four others at Muirfield last week that marked the tenth anniversary of Scotland being crowned as world amateur champions by winning the Eisenhower Trophy in Adelaide. 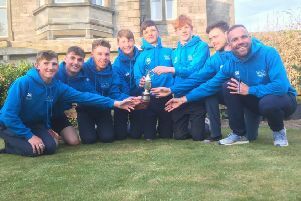 That historic success, of course, was achieved by Wallace Booth, Gavin Dear and Callum Macaulay and they most certainly deserved the opportunity to meet up again with George Crawford, the non-playing captain from that week, to reminisce about pulling off one of Scottish golf’s greatest victories. It was fitting, too, that Ian Rae and Spencer Henderson, the two main Scottish Golf Union coaches at the time, were also involved in the reunion, and the same goes for Alistair Low, who, as chairman of the governing body, was out in Australia as well. It’s a success worthy of celebration. The tartan trio, after all, put Scotland on top of the golfing world in style, finishing nine shots clear of a United States team made up of Rickie Fowler, Billy Horschel and Jamie Lovemark. Macaulay finished second to Fowler in the individual standings, but it was the team result that mattered most. “We all said on more than one occasion during the meet-up that it just feels like yesterday due to it being such a great week,” added Macaulay. “It is a stand-out achievement in Scottish golf among some isolated others. There’s guys that have won the British Amateur, there’s guys that have won the South African Amateur and other big events all over the world. But as far as a team event goes and what it stood for at the time, I think it takes a bit of beating. “I think the re-introduction of golf in the Olympics has maybe overshadowed the Eisenhower Trophy now, but I always said that the Eisenhower Trophy was the equivalent of the Olympics for golfers as there are so many countries that take part (65 in that Adelaide event, for instance). “It is a really special tournament and the fact we went to Australia, prepared really well for it and got out of it what we were hoping to is a great achievement. They put together a team from GB&I for so many years then split it into individual countries and for us, such a small country, to win it really was terrific. “Can Scotland win it again? I’d like to think so. I don’t think, with the mentality of Ian Rae and the way he prepares his players, that we will ever be turning up at the event not trying to win it. It is a tough thing to do. I believe the total age of the Danish team that won it this year was 51, which is just ridiculous. That is unbelievable and the type of thing you are having to compete against these days on the world stage. While all three turned professional off the back of that historic success, only Booth is still pursuing a career in the paid ranks. 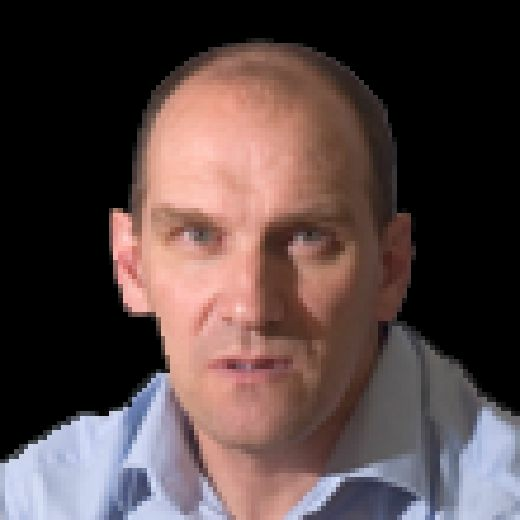 Dear, who works for Shot Scope, the innovative golf tech company in Edinburgh, has already been reinstated as an amateur and Macaulay, a senior sports consultant with FirstPointUSA, a company which helps potential sports stars of the future gain places at American Universities, is just waiting for his official clearance. “I think the fact Gavin and I have stepped away from golf as a playing career and are not focused on that any more made last week even better as it brought back the good memories,” admitted Macaulay. “I’m hoping that next year I can play a bit more. I’ve got my holidays planned out strategically so that can happen. I get my amateur status back on 19 May, which is at the start of the domestic season. I will maybe start off with some 36-holers and see what handicap I get. “I’m going to have to start from the bottom again, so it is going to be a slow process. But, provided my work schedule allows me to practise a bit and I feel I am playing at a decent level, I will consider entering some of the bigger events, the Order of Merit stuff and possibly the Scottish Amateur. Not any more, though, and that’s great to see. While things may not have worked out how Macaulay, Dear or Booth all would have wished as far as playing was concerned, no-one can ever take away what they achieved on the biggest stage in the amateur game.